This postcard is a gift to Bells for Peace Inc. from Frederick Brandt, former curator, Virginia Museum of Fine Arts. Mr. Brandt obtained this card when he visited the 1939-40 NY World's Fair. 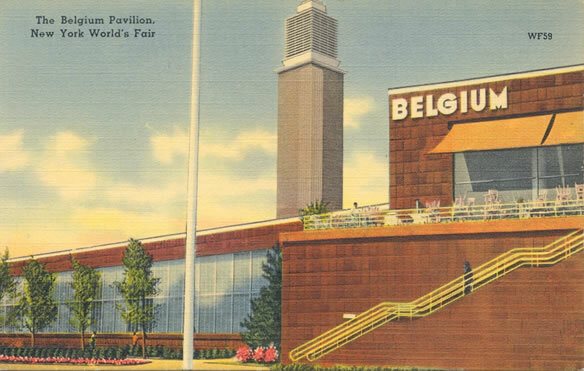 The Belgian Pavilion at the New York World’s Fair was a prefabricated building that represented Belgium at the 1939 exhibition. The building is important because it was designed by the world renowned Belgian architect Henry Van de Velde (1863-1957) and is listed as a National Treasure and a Virginia Historical site. It was conceived to be re-built in Europe. It was also important because it was an early representation of modern architecture. Leon Ploegaerts, Professor Emeritus, Ottawa University and co-author of L’Oeuvre architecturale de Henry Van de Velde, written in French, is an expert on the works of the architect. His references to Virginia Union University’s Belgian Building, with color plates, are documented on pp. 211-213 and 412-414. (Ploegaerts, Leon and Puttemans, Pierre, Bruxelles-Quebec, Vokaer-Les Presses Universitaires de l’Universite de Laval, 1987). According to documents in the Virginia Department of Historic Resources and the L’Oeuvre architecturale de Henry Van de Velde, the New York building had the following features: patio, cafeteria, atrium, colonial pavilion, hall of honor with a raised gallery, arts and crafts gallery, industries gallery, pavilion of the Belgian Congo, exterior staircase leading to the terrace of the restaurant located above a cinema. Virginia Union paid for dismantling the building to its new site. Virginia Union’s cost for the building, that included the tower (called belfry), was $500,000, raised largely through the work and influence of its first African American president, the late Dr. John Malcus Ellison (1889-1979). The Belgiam government gave Ex-President Hoover (1874-1964) the building’s carillon for his new library in Stanford University’s Hoover Institution Library. Consequently, he (Hoover) raised the needed $16,750 for the carillon. The Belgian American Educational Foundation (BAEF) provided added assistance. In both instances there were to be on-going costs for renovations and repairs. The Ploegaerts and Puttemans book, referenced above, describes the reconstruction of the Belgian Building on the campus of Virginia Union University. Three buildings are laid out in a U shape and include the industrial gallery from the original building transformed into a library with the tower reserve for 94, 000 volumes. Set up perpendicular to the library to which it is attached by the tower, is the former colonial pavilion transformed into a science center linked by a covered passage to the former hall of honor converted into a covered basket ball court for 2000 spectators. The first stone was laid on June 19, 1941 and it was completed in 1942. It has not undergone major modifications and so has retained its original style. Leon Ploegaerts, Professor Emeritus, Ottawa University and co-author of L’Oeuvre architecturale de Henry Van de Velde was interviewed by Dianne Watkins in spring 2004 by telephone, informing her of his book. Donald Scoggins, grandson of Dr. Ellison obtained a copy of related pages of L’Oeuvre architecturale de Henry Van de Velde from the Library of Congress. Andrea Murphy, Cultural Officer, the Embassy of Belgium conducted the translation from the French version to English in spring 2005 for Dianne Watkins. Dr. Elena Danielson sent Dianne Watkins a copy of her book: “For Peace Alone Do I Ring” in spring 2004. This photograph was published in a 1937 issue of L'Illustration, a French news weekly which catered to the conservative middle class. 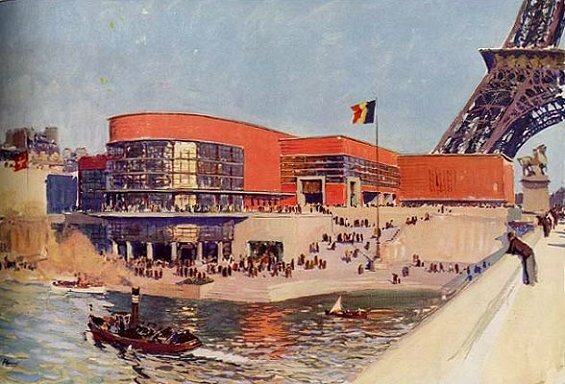 The Belgian Pavilion had a prominent location in the fairgrounds as the first structure situated Northeast of the Eiffel Tower along the bank of the Seine River, which French Prime Minister Léon Blum, and Leopold III, the King of Belgium, had agreed upon. Belgium's prestigious location can be attributed to its historical ties with France. In 1794, Belgium was conquered and annexed by France and that stayed under the French Empire of Napoleon until 1815, during which time French became one of the country's national languages.
" The Belgian Pavilion is a rather disappointing work of the grand old man of European architecture, Henri Van de Velde, for which perhaps his younger associates may be blamed. It is most effective at night when the heaviness of its red terra facing to some extent disappears. But beside the lightness and vitality of the illuminated Eiffel Tower, it appears even at night to belong to another world. Although without much distinction of proportion, its thin curtains of white pale blue and yellow, and its opposite wall of red marble and mirror is vying more successfully than do most of the sumptuous interiors of this building with the comparable splendors" (Hitchcock, 168). The International Exposition of 1937 was a remarkable display of national pavilions, of which the Belgian Pavilion was a vital asset. Following the Exposition, it was demolished* and Van de Velde's attempt to reconstruct a replica in Brussels was unsuccessful. *Note: The Belgian Pavilion of the 1939 New York World’s Fair was not demolished. 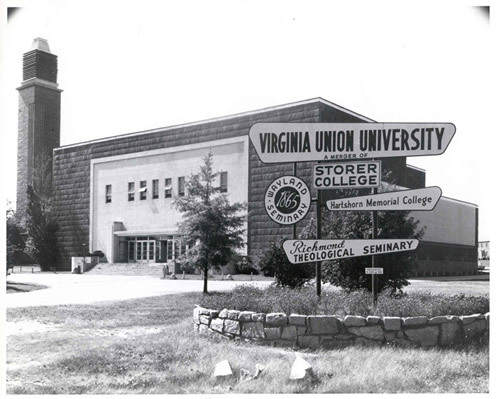 In 1941, it was dismantled and relocated to the campus of Virginia Union University where it housed a library, gymnasium, and science and art classrooms. This information was brought to the attention of Stanford University and Hoover Presidential Library archivists in March 2004.